Friends is seeking a knowledgeable native plant enthusiast to help direct care and development of our Native Plant Garden. 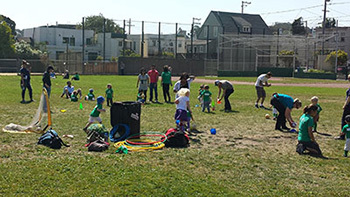 With the first session of Fall classes underway there is still room for you to get out and play with SF Rec and Park -- especially, in the second session. See the daily schedule of Upper Noe programs and registration info. Food Class Cancellations – Baker John regrets that he will not be able to teach this fall. The Art of Holiday Cooking, The Art of Baking Bread, Home Cooking 101, Food in Jars, and Petite Bakers are cancelled. Look for most of these to resume in Winter session. Future Chefs remains on schedule. Flag Football (Coed) needs a few signups to fill out the teams in the 10-11 year old (Wed 4:30-5:30) and 12-13 year old (Wed 6:30-7:30) sections. Girl’s Basketball is still open. Tasters Choice Girls in Sports (Wed 4:30-6). 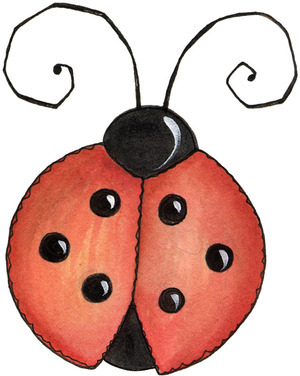 Come work with the Ladybugs this Saturday, Sept 13 from 9 a.m. to noon as they do some end-of-summer gardening and scope out ideas for some exciting changes. Recently, the grounds crew at Upper Noe reorganized, which means a new perspective on the gardens. Leading our new gardeners is Park Section Supervisor Wayne Kappelman. Wayne, a 12-year veteran with Rec & Park, will manage a scaled down but talented crew of seasoned gardeners. Together, they have already made a major dent in backlogged maintenance. The backlog was created when injuries and other types of leave, and pressing problems at other locations, depleted our local staff, making it difficult to handle the workload by traditional methods. So, Wayne is organizing a smaller crew into a squad that that has the knowledge and skills to handle every situation. The new crew will come en masse maybe once a week or so, in contrast to the usual practice of having a regular gardener two or three days a week. Our former staff, including Park Section Supervisor Teresa O’Brien who has been in and around Upper Noe for many years, continues to serve in nearby parks. Come on out and see what is growing in the gardens. With an exceptionally dry summer, one would think that any plants lacking irrigation would wither and die. However, natives of California, adapted specifically to our fickle rainfall, are thriving in the northwest corner of the park. 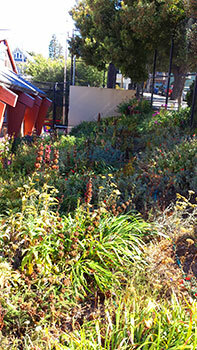 The Native Plant Garden is a labor of love launched in 2011 and spearheaded by former Friends chairwoman, Kate Haug. Using a bare patch of land left over from the building’s renovation, Ladybug Gardeners, Rec & Park gardeners and local volunteers installed an array of plants supplied by Friends of the Noe Valley Recreation Center. Additional natives found homes outside the fence along Sanchez Street. Friends continues to buy and plant replacements and new species. One new addition is doing extremely well; Island Bush Poppy is a shrub with bright yellow flowers. View garden details at http://www.noevalleyreccenter.com/facilities/gardens/ . After six seasons of hard use, the athletic field is getting some intensive love and care. Gardening staff recently aerated, seeded and fertilized the entire field. Regular sprinkling will continue. Park Service Area Manager Steve Cismowski says even though Rec & Park has a mandate to reduce watering during the drought, the deteriorated condition of the turf makes this work necessary. Gardeners are minimizing water use between sprinklings by hand watering and working closely on the bare patches. The goal is to have the field in top-notch shape again for spring baseball. At right is the James Lick girl’s softball team, which calls Upper Noe home field. Of course, Soccer Tots and the myriad other users will benefit as well. So far, there are no plans to close or to reduce use of the field but a wet winter will have that effect and help the grass rebound. We will keep our fingers crossed. 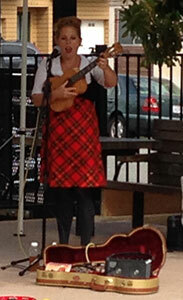 Uni & Her Ukulele squeezed out pure magic last month in the playground. Children and parents were delighted by her sweet melodies. This was the final concert of the season. Friends’ Concert in the Park series will resume in the spring. Joby's Beach - It is always social in Joby’s Run and large parties have gathered on these warm, sunny afternoons. 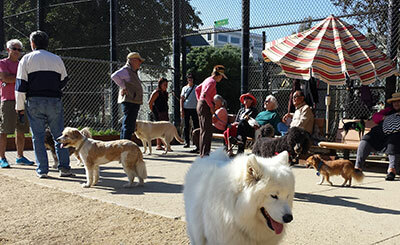 Folks linger longer to discuss the issues of the day, neighborhood news, pet care and politics. The recent addition of an umbrella adds a festive touch as well as comforting shade. It completes the beach atmosphere created by the surface that has become extremely dry and sandy now that the drought has forced Rec & Park gardeners to shut off the sprinklers. The official order is to forego water use for anything that isn’t growing. Disaster preparedness, health, and social services information for people of all ages. Child car seat safety checks. Free live music, snacks, popcorn and beverages, and prize drawings. Handouts and children’s activities include bouncy houses, face painting and safety workshops with parents. 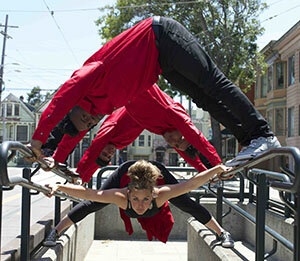 For more info: 415-282-4647 , dhcasf@gmail.com (Betsy). 6 tours daily at 11am, 11:45am, 12:30pm, 1:15pm, 2pm, 2:45pm.